Review: "Wrike is the perfect balance of usability and power"
We needed a project management platform that suited a small to medium-sized business, but still had full feature capabilities and custom workflows. Since we are still on the small of the medium size for companies, something large scale just wouldn't work, and JIRA, which is used by our developers, takes too much customization to make it capable for a sales, marketing, success, and operations teams. There are other options out there, but Wrike was just the right fit and will help us scale a great deal. Their interface is intuitive and easy to use. It's clean, and I really like both their mobile app (iPhone) and their desktop app (Mac). Customizing workflows and approval processes is relatively easy, and adding to multiple projects with multiple assignees and watchers is excellent. The organization is excellent and intuitive. Search functionality is pretty great. Both make it super easy to find what you're looking for... new, old, completed, etc. Really like the different views - Konbon, list view, etc. If you're used to Trello, Basecamp, Asana, etc... there's a view that's pretty comfortable to you. The Gmail plugin could use some work. Love having it, and it makes adding tasks from email easier, but it's pretty slow. Intuitive things are missing - for instance, by default I want these tasks assigned to me. I have to go choose "assign", then search for my name, then click Assign. Pretty slow and cumbersome. Merging duplicate tasks or linking tasks is not the most intuitive, and isn't super apparent once it's done. Would love to see them take a page from Atlassian's book on this one. In some of the views, it would be nice to have "quick edit" features so you don't have to actually dive into the task. This is possible in the table view, which is super helpful, but would be nice elsewhere also. In their defense, I don't think any project management tool does this well. User Review: "Wrike: Just Right"
We started using Wrike in just the Marketing department, but it worked well enough that the Client Support department has started to use it as well. We use it for task management primarily — we don't do time tracking or anything like that in it. It works well for making sure that everyone is aware of deadlines, and that everything is passed on to the right person once it's done. It's a good way to organize communication around a particular project or task as well, rather than trying to sort through slack messages or email. The search functionality looks pretty crowded when it pulls up results. The "My Work" feature doesn't seem particularly helpful, compared to the customizable dashboards and calendar view. It's very useful for projects that require step-by-step tasks to be done and a lot of collaboration. It's particularly well-suited for creative teams because the commenting on images/PDFs is pretty helpful. I love the Document Editor - you can make changes in a word document without having to manually download the file, open it, make changes, save, then re-upload. Just click a button, it opens, make your changes, close it, and it is saved & uploaded as a new version automatically. I think it's less suitable for people who don't necessarily have a lot of deadlines for individual tasks - if a large part of your job is waiting on external people to get back to you or create something, it might not be the right system. User Review: "2 cents on Wrike"
Wrike was implemented in a department among a public university. Our department handled developing websites for educational purposes. Wrike allowed for a clear, efficient way to track progress for all the steps in website development. It also allowed us to track who on the project was tasked with what and how much of their time was devoted to each project. Tracking changes-- any time a change is made by any user each individual task indicates the change and WHO made those changes. Time Management-- time can be managed at the individual task level with the option of manual entry or a start and stop-timer at the top. Multiple projects are handles well, and people can have access to all projects or only those that are important to them. Training would be key. As this is the first project management tool that our department utilized and it has a LOT of features. I think additional training opportunities are key to success. It is helpful when you need attention to detail and the ability to communicate with your team and keep everyone on task. Wrike is also extremely helpful when not everyone works in the same location or at the same time. Updates can be put on Wrike and information can be kept for review at any time. It would be less beneficial in environments where information exchange isn't important. Wrike Review: "Fastest way to get your team organized!" Wrike is used across the Marketing department. It is a way that we submit all requests for new assets, edits and future projects. It easily organizes all conversation in an easy to use interface. I was able to pick up the platform within the first week of it being introduced to me. We have never had an outage/downtime while using the product, so it has proven reliable. The search feature is a powerful & instantaneous tool that pulls information out of any post that you might be a part of. Multiple views - List, Gantt Chart, Board, Stream, and Workload. Everyone processes data differently - something for everyone. Everything in one place. Keeps everyone engaged and on the same page. Occasionally I will have to reload a tab to make sure Wrike it updated (This is day to day - never within the same day ). It has A LOT of features - our company is not using it to its full potential. Maybe a weekly email with quick demos of what can be done with the product should be added. Wrike is very well suited for building creative projects. Our graphic designer can easily attach assets in a Wrike ticket and all communication can be found in one place. Multiple times we have had to go back to closed tickets and pull assets. Very easy to find what you are looking for. If you have multiple people constantly adding comments to a single thread - things can get buried. Wrike tends to bundle conversations under a "show more" button which isn't always the easiest button to notice when scrolling through a thread. Review: "Managing the content creation process with Wrike"
We are using Wrike to manage our custom marketing piece requests in conjunction with our account-based marketing efforts. It is used extensively by our marketing and sales departments to address a process that used to be managed both informally as well as in JIRA. The initial navigation doesn't feel as user friendly as it could be. There is a bit of a learning curve to get project requests entered. It's been immensely helpful getting a large volume of custom marketing projects created and getting insight on the project back to the sales team. We can also more easily navigate the library of content to see if there are past pieces that are applicable to a current need. We previously used JIRA for this and that was a much harder way to get projects created and understand the priority of each. It was also much harder to use in a post creation library fashion. Wrike is used predominately within our marketing organization to manage their team project load and timelines. However, they also use it cross-departmentally to help communicate projects and grab resources on an as-needed basis. I typically have at least a few projects that I am assigned to within Wrike. Previously, our services management team used it to manage larger scale yearly goal type projects as well. Manages project tasks in a fairly robust manner for internal office use. Effectively notifies people when tasks have been assigned to them, and project updates have occurred. Allows you to track time against projects if you so desire. It would be great to see Wrike come out with a more robust reporting solution. It would be great to see Wrike come out with a solution that allows cost tracking. I am not sure this is within their core though, and it makes sense to not add it if that is the case. Wrike could improve on their ability to integrate into other software systems. Wrike works extraordinarily well for communicating projects within a department and cross-departmentally. It is a great tool for collaboration and allows everyone involved in a project to stay in tune with the status of said project. I think this is a great solution, and I wish more of my company would adopt it as our internal tool for project tracking. This solution is not a great option if you are looking for a robust solution for tracking professional service projects or the like. Wrike Review: "Once you learn the system, it rocks!" We use Wrike through the entire organization. Since we are a small team of 8, most of our employees are involved in most of our projects. We use it for project management and many of our employees use it for task management. It helps us maintain the big picture projects that span multiple months and see how those projects coincide or clash with other projects. PMs can easily assign tasks to appropriate people and add enough context to tasks that it makes sense. Customizable Dashboards: Each user can set up their dashboard as needed. Very helpful. Customizable workflows: Creating approval workflows and others lets our organization customize Wrike to fit our needs. Rich comments and description fields for tasks gives very helpful context to tasks. Comments can get messy fast if that's your primary form of communication. Search leaves something to be desired, especially when searching down at the subtask and comment level. We don't use it often for this reason. It's really big with a ton of features, so it can get overwhelming at first without good training. If you're a PM and you're serious about keeping things organized Wrike can work really well for you. It's very customizable (with the right paid add-ons), and has a lot of ways to view and manage projects. If you're just looking for simple task management or project management lite then, you can find cheaper and less heavy duty software out there. User Review: "Is Wrike Right for You?" With a distributed team, using a centralized spot to track tasks is critical. This is where Wrike has come into play and has made communication across distance easy. Initial setup can be difficult to refine business processes. It can get expensive if you want to add everyone with a full license. If you want a tool that is flexible and is able to adjust to changing projects, Wrike is well suited for that. There are some very clever features that will help you along and see what a full team is up to at anytime. Great for agile, nimble teams that need to work across distance and time zones. Wrike Review: "Packed Full of Features"
Within our company, only marketing is currently using Wrike. We use it for task management, to create workflows, to create a space to track projects, and as a way to track information. It works especially well for a creative team by also letting you build your own review process that allows you to comment and review documents and files. Wrike does well at reporting. It provides visibility for managers and allows you to report on task being accomplished as well as individual performance. Each task and/or project has so many features. You can store files in the tasks, create subtasks, add fields for the task that store data, create dependencies, share the task with other, set deadlines, track the time you spend on each task, and move the task through different workflow stages. Having all these features makes it very easy for this software to fit any work situation. Wrike does especially well at providing it users with a review process. Not only can you attach files for others to view, but it allows you to review the documents and make comments in Wrike. This makes the process so much easier to maintain and finish quickly. Because it has so many features, it can be difficult to get a good grasp on how to use it best to fit your team. It definitely has a learning curve, but I still wouldn't consider it hard to use. Wrike can easily become cluttered feeling and difficult to digest all of the information quickly. If you prefer things to be super simple for task management, then Wrike is not for you. If you need to be able to track your team's work in order to give good reports to management, Wrike will be a big help. 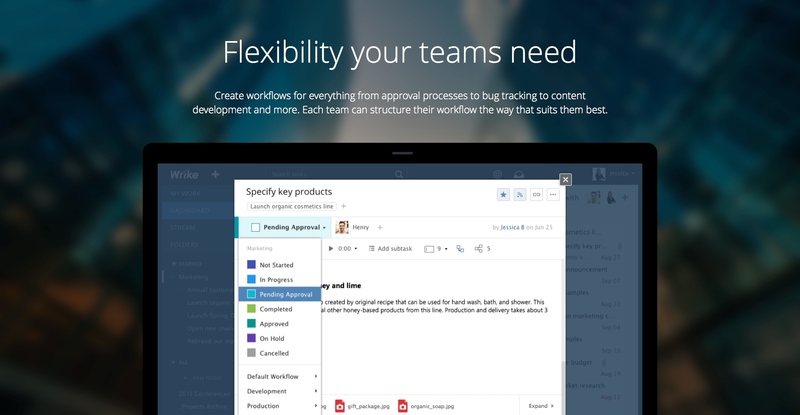 If you are really big on workflows as well, Wrike will do the job. However, if you are looking for something simple and easy to digest, Wrike will probably be a little too much for you. Wrike Review: "Best task/project management software I've ever used." Our marketing department heavily uses Wrike for all of our project management. We use it to submit requests for projects, plan out timelines, track the status of projects throughout their cycle, and as a robust individual task management tool as well. Additionally, other teams use it throughout the organization, although to varying degrees. Our team also uses Wrike to collect requests from across the company for projects like the creation of collateral, sales enablement pieces, etc. Wrike makes it tremendously easy for multiple team members to collaborate on projects. Wrike makes it easy to maintain version control of documents that are part of our projects. The document editor plugin comes in especially helpful, as it integrates with Microsoft Word and makes it easy for one person to upload a document, another person to review/edit/comment on that document, then send along to the next person. The calendar function gives me a quick at-a-glance view of what I have to accomplish that day/week/month. Reporting is quite easy. Customized reports make it simple to get a quick yet detailed view of tasks and projects using a wide variety of criteria. And it's simple enough that team members can easily create their own reports without a complex training process. A wide variety of views (list view, Gantt charts, dashboards, kanban-like boards, etc.) allow for tremendous customization. There really aren't many parts of Wrike that I find frustrating. Like most powerful programs, there is a bit of complexity that can be daunting at first, but even this particular aspect wasn't terribly overwhelming. This is a minor point, but when adding custom fields, in subtasks the order of those custom fields gets shifted around in the task view, making it difficult to find specific data if there is a large number of fields. Great for individual task management and especially for teams to collaborate together. For example, our content team can upload a document, review/edit it together, then send it off to our design team. When they've finished the design process, they can send the graphical files to our web team which can publish the final content... all of this trackable and reportable so it's always clear where the project sits at any given time. Additionally, I use Wrike to manage my own tasks I'm working on at any given time. My desk is free of sticky notes because I know I'll never forget anything I'm in the middle of, once I enter tasks in Wrike. Wrike is being used by our organization for one primary purpose, which is project management. Although there are multiple uses of the software, different teams in our organization use its other modules for secondary purposes. Since our organization is so large, there are a variety of tools used by different teams based on their requirement and usage. It is not possible for our entire organization to use just one tool. Wrike addresses various solutions in project management within software development. Projects can be well managed, reported, and reviewed on a daily basis using Wrike. Project Management: This is a very strong tool for real-time project management and resource management. Charts: It provides GANTT charts, which give a very easy visual representation of where we stand in our current process of development. It provides process improvement and transparency to the current status of projects. Since it can be integrated with other software, data can be imported and used efficiently. Set up is daunting. Although we paid for someone to help us set up the process, we quickly realized that their orientation instructions weren't suited for our situation at all. With sub-tasks, changing a task's deadline would also change the subtask's deadlines. When I push things forward or backward with the GANTT chart, I then have to go into each subtask and adjust them as well. Sometimes, it seems easier to make everything tasks, so that I can use the cause/effect of dependencies. The design could be improved. It's functional, attractive, but can still go a long way to make it more intuitive. It helps us collaborate and have the entire team surrounded and working on a common goal and keeping a real-time status of their projects and goals. It helps us to consolidate communication and give more attention to third party members and their progress. It gives transparency into what the team is working on and where they currently stand. The GANTT charts give visibility into future planning. It helps set up workflows for projects, to notify tasks and know when they should begin work. User Review: "Wrike: MS projects for the cloud"
My organization uses Wrike for project management and task requests for our marketing team and web management team. This tool is also used for knowledge base management for marketing activities and approvals. Wrike supports a lot of project management styles such as waterfall, list, and kanban/agile workflows, which makes it nice for working with a diverse team. Price per user is high, so supporting more non-user collaboration would make it more accessible for people who only need to be notified of Wrike activities. Wrike is best suited for companies looking to support a few power users who need a cloud-based version of Microsoft project. Less beneficial for lots of low-intensity users due to the per-user cost. Wrike Review: "Wriek - a great tool to manage software." Wrike is a project management software to control the flow of a project. It is cloud-based so can be used anytime and anywhere. Gantt charts, workload view for resource management, structuring projects according to priority, making categories, department wise project flow are the features can be used widely which are helpful to manage projects. It can be integrated with slack, SalesForce, Dropbox etc. which makes it easier to handle a task for project managers and developers. In my company, we use Wrike to create sprints, projects which go through approval and then we submit these to developers and other employees to work with. Wrike has the functionality of getting reports in various ways which help to track project and tasks more easily. Drag-drop of folder and tasks functionality allows to set those in different categories like a to-do list, QA, done etc. which helps keep tracking tasks of employee’s and tasks state, reports accordingly. Drag and drop functionality helps a lot to maintain a project. UI/UX design is simple and easy to use. Learning all the functionality is not so difficult. Maintaining project flow, reporting with different ways like Gantt charts etc. creating a timeline of projects, its deadline. Commenting options on projects, tasks so that employees can report any problem on tasks. Customizable options like status, out of office, custom fields, when a task is complete. It is better to train new employees to use its features more. It has vast features and functionalities. Wrike is very helpful for maintaining a clean project flow. It can be integrated with other products like Google Sheets, Slack, and Dropbox, so you can store your data easily. It also has options available for chat, and it helps to keep track of the project. The application provides a lot of personalizations, be it in reporting or in the creation of folders. You can create folders and subfolders to keep tasks where they belong. Employees can comment on tasks about their problems, data changes, etc. keeping track of tasks is very important in the software industry for a large project. Wrike Review: "Excellent project tracking tool." Our team uses this to keep track of projects, our activities, and our schedule. We use this to manage our current project and its been extremely handy for us. I set up and assign tasks to my team using this and it lets me track those things very easily. The tagging features are really powerful if you use them correctly. It is also really good at keeping a record of our communication which in turn leads to improved accountability within our team. It has definitely contributed positively to our timely delivery on goals. It is really scalable. Works well in multiple use case scenarios. You can customize it to a fairly large extent so you can make it work with whatever your workflow might be. It is pretty simple to use, won't require training or downtime on your team to get this up and running. No downloads needed, works great right out of the browser. Plus the mobile version is nice too. Pricing is certainly a limiting factor depending on your team/business size. Notifications are overwhelming. Maybe there is an option that I missed that controls that though. Its a really good tool if you are managing a mid-sized team working on a project. It will certainly improve your planning and organizational capability. Especially within the team. It also encourages accountability on an individual level which I love. It also improves the visibility of the project within the team. If you have a smaller sized team or if you work on really short term projects, you can probably get away without using something like this. User Review: "Wrike Makes Work Easier!" 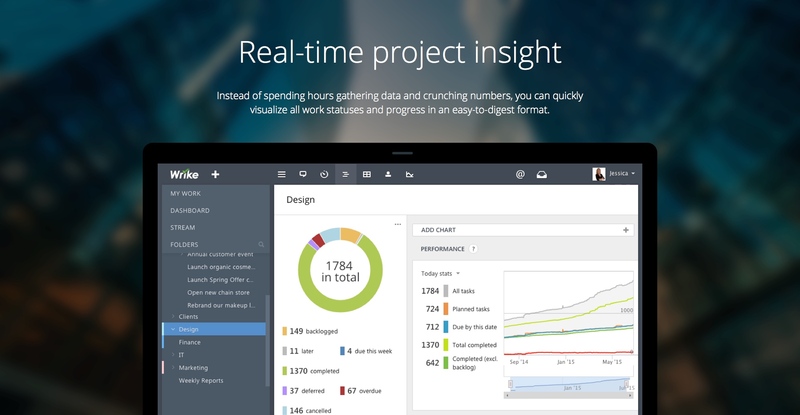 Wrike is used for project management within the marketing department. This tool allows stakeholders from different teams to submit requests to my team, which handles marketing automation programs. The Wrike request form gathers all required materials for the program, and my team reviews requests and creates a project timeline with scheduled tasks. Wrike allows multiple teams to communicate in one place. Advanced Request Forms - With Wrike, I was able to develop a master request form to cover all different types of projects. The form asks the necessary questions depending on the type of project requested. Having one master form alleviates stakeholders from sorting through a list of request forms and trying to figure out the correct one to use. Highlights daily tasks - The dashboard has a "My Work" tab that displays all of my tasks due that day, as well as any overdue tasks. Simplifies multi-team project communication - Updates, discussions, and questions surrounding a specific project can all be found in one place. This is so much more efficient than communicating project details via email. The learning curve is steep for new users, mostly because Wrike has so many different features and functionalities. Wrike is awesome for streamlining my team's project process. The scheduled and assigned tasks for each project provides me with an upfront to-do list every day, and it allows my team to stay on track. The report feature has allowed my team to see hold-ups, work distribution, and room for process improvement. Since my team supports many different teams, we need one place to manage all projects in one place, and Wrike allows us to do so. Review: "Wrike is a comprehensive solution enabling a diverse Marketing team"
Wrike is being used primarily for the marketing team to manage multiple projects and campaigns over complicated deadlines. The Wrike interface is particularly helpful for managing design and content projects with freelancers. Wrike's clear and simple status update feature allows our team to easily track ongoing initiatives without having to waste time with constant email and Slack update requests. 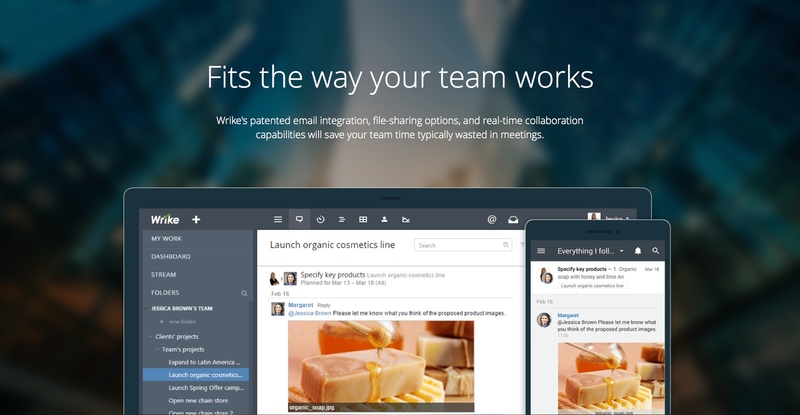 Collaboration: For us, Wrike is a teamwork tool first and foremost. The technology allows our team to communicate on a project in a common space so we don't need to search our emails, Slack messages, or meeting notes to recall next steps. Workflow: Our team works a lot with outside designers, and this relationship is managed by our Director of Design. Through Wrike, all of our designers have their own login and have permissions to access the projects they are assigned. From there, individual team members are able to communicate directly with the freelancer to develop a project, and our Director is able to check-in at any stage and offer final approval. Requests: Our Marketing team loves to source ideas from other areas of the company, but it's not always a simple process. Wrike has a feature that lets us collect detailed requests from colleagues and filters those requests directly to the appropriate marketing team member. We are a scaling company and growth means that not every employee knows who is responsible for what, so we've found this feature to be easy to use. I find the search functionality in Wrike to be a little difficult. If a project has been put on hold, it can be hard to find down the line. If a project is on the smaller side, building out a brief and scheduling in Wrike can be a waste of time. We typically keep only our large projects in Wrike, which means we are constantly switching in and out of Wrike as a task manager. There's a bit of a learning curve and I don't think our team is even close to utilizing all the capabilities of this tool. Not sure if that's a criticism of Wrike, but just something to keep in mind. Wrike Review: "An awesome project management solution"
Wrike is being used to on the creative, creative ops, and brand marketing teams to streamline project management across the org. We produce a lot of assets, and Wrike helps us stay on track. Dependency management. The ability to seamlessly shift project dates based on dependency relationships. Recurring task functionality is cumbersome and sometimes time-consuming. Great for large teams with multiple stakeholders producing lots of deliverables. Not as well suited for lean teams with few tasks. User Review: "Wrike: Increase productivity"
Wrike is used by our organization as a whole and not by any particular team. For that we have different product, JIRA. Using Wrike we can create, manage, and keep track of every project which are either in progress or in the pipeline and my projects. [By this] I mean non-technical work related to SEO, cataloging, marketing etc. Easy to manage and UI is great. The timeline shows a clear view of tasks. Can comment on images also. As for now no issues faced by any organization employee. I would definitely recommend this product to other people. I like one feature - the reports; we can easily check the timelines of each project. In my previous organization, we developed software ourselves and used a Gantt chart feature for checking the status of projects but this product in my current organization made it easy. Wrike Review: "Great project management app for startups and small teams in general"
We use Wrike across our organization primarily for our dev team to organize their product pipeline, as well as for our implementation / client success team to deliver feedback via ticketing system on tweaks / bug fixes that need to be made. Permission setting are pretty granular for ensuring only certain people see / edit stuff. Not as 'pretty' as some other more modern project management apps out there. Wrike has been around for a while which is a strength in their market presence but like with any large company, there are always smaller competitors that fit better niches or have a slicker, more intuitive UI/UX. It's well suited for use in a team project setting where you need to organize a lot of interdependent tasks with time sensitive deadlines, etc. It's less appropriate to use as a single-user task management system. There are many better ones out there for that like Todoist, Wunderlist, AnyDo, etc. Wrike Review: "The best task management system I've ever used"
Wrike provides us with a ton of data. We use this data to measure the effects of our Research and Project Management Team. We live in Wrike every day and we can pull daily, weekly, monthly or customized reports which allow our managers to determine team and department workload. It's better than Trello in that it helped us scale as our professional services organization grew. Wrike stood out from the rest by being a robust and flexible project management tool. Wrike has very clean and user-friendly interface. You don't have to hunt for your work or get hung upon technical glitches or errors, you see what you need to see when you want to see it. I would like to see Wrike extensions on Firefox too, not just chrome. We have a lot of back-and-forth between teams, and Wrike makes that easier to deal with. As a result, there's less frustration on an individual level and higher productivity across the department. I also personally really like the calendar view. It makes it easy to see what coming weeks look like and if I need to work hard to get ahead and not get swamped. Review: "WRIKE! Good for some, not so good for others." Our company uses Wrike as an overall project/task management tool. It started in our production department, and has since been implemented company wide. It is used to address our issues with task tracking, time management, task responsibility and overall project tracking/communication. It has also become a useful resource in compiling company protocols and information on the Wrike knowledge base. Wrike does a great job tracking tasks, and providing a space for project specific communication. Wrike is extremely useful for delineating responsibility and assigning projects digitally, and tracking the progress of those projects. The application is a great tool for compiling company info, and allowing users across the organization to access department specific info from all over the company. Setting up an entire project with dependencies etc. can be daunting and is a lot like databasing. It is not the most user friendly. Email notifications should be done differently. Users are alerted to every mention/inbox/project or task update, and then another general Wrike update email. It can become a bit much. Despite being a great tool for project management and task/project assignment etc., it promotes unrealistic goals when getting tasks/deadlines from users who have no idea what your workload is or what is on your task list. For our company, and others, Wrike is a perfect option for project management, especially considering the ability to gauge task time etc. The issue is though, unless you are technical in nature or very project based, it can become a hindrance. So, for our organization it works great for getting certain productions off the ground/managed, but for simple task management it is too much and can cause more harm than good. Wrike Review: "Exactly what I want"
Wrike is being used in our entire department as the main project managing tool. Wrike designed perfectly and can suit those who want to be highly organized in their job. It is completely web-based software, so you don't have to download anything. You can organize your projects and events easily within unlimited folders.The timeline tool is great for prioritizing and tracking your budget and your events. It will take time to adapt. Wrike has perfect design, but its interface is little bit confusing. There are great tools for almost every kind of task and project. And you can see all of our clients, projects and tasks in one place, that's amazing. You can check which departments are overloaded and which team already done their tasks. In my view every project manager must have Wrike, because it leads you to always keep organized and be on time. Review: "You Don't Need a Project Management Certification to Use Wrike"
I use Wrike for managing all types of creative and web design projects. It has everything I need for scheduling and deadlines. I make lots of notes throughout each project and export them at the end. It gives me an accurate picture of the project and serves as a record of client requests and interaction. I am generally the only user although I've used it to coordinate multi-channel marketing efforts for a small team in the past. With projects/folders and task breakdowns, I can accurately plan projects and see my project load at a glance. It definitely keeps me organized and gives me a visual way of looking at my work load. Projects and tasks. It's very easy to create a project or folder and subsequent tasks. When I used it for a larger team, we had an enterprise level subscription and the ability to create numerous folders and sub-folders. We planned out the entire folder structure, scheduled every marketing task and put everything on a schedule. Once it was set up, it was an invaluable tool for managing all of our activities. Project filters and views. You can drill down and filter projects to see specific timelines or tasks. I especially liked the feature where you could export the whole thing to Excel to manipulate further, or pass on as a report. Wrike can easily provide a clear picture of what's "on your plate" for a few days, weeks or even months. Interface. I'm a fan of clean UIs and Wrike has always been uncluttered (even with tons of tasks) and easy to use. The interface is glitch-free and I don't have any problems. Files upload, changes save automatically, etc. They regularly add new features and I like the integrations with Google Drive and dropbox. Many times, I upload comps or drafts of creative I'm working on, along with notes. 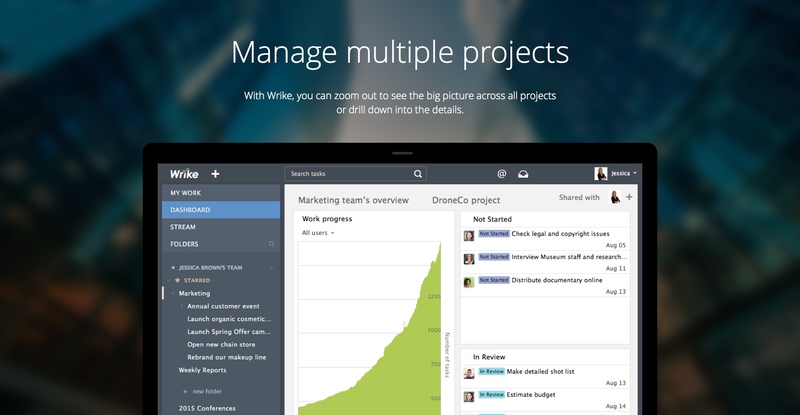 I've tried other project management and collaboration tools but Wrike is it for me. I have no project management certifications but I am technically savvy. Some PM tools were overkill for my needs but Wrike easily did what I wanted it to do: schedule multiple marketing channel activities and assign tasks related to getting them out. For example, we had direct mail campaigns, email blasts, social media posts and industry specific ads that went on throughout the year. I was able to schedule everything and generate monthly and quarterly schedules for senior management so they knew what we were doing in advance. I assigned tasks to graphic designers and others on the team related to each project. In terms of more traditional project management, Wrike can do that too. Gantt charts, scheduling resources, dependencies, time management, etc. It is awesome for web design projects. Wrike Review: "Great product, terrible name"
Our whole organization is using Wrike, each department with a different purpose. It has helped solve huge problems in coordination and communication that used to exist in a much greater degree. These weren't just internal changes either, Wrike has helped us to provide better coordination and communication, as well as transparency, with clients. Since we adopted Wrike, clients have been more invested and helpful in our efforts to serve them. We even regularly assign them tasks, which has greatly increased the turn around time on data requests. Wrike has a great timeline feature, that we use as a Gantt chart. Unlike other task management systems, this is included in the price and works very well. The milestones, dependencies, and subtasks make the charts very user-friendly. Wrike has an endless subtask system, which is necessary for our company. We looked at many different systems before selecting Wrike, and I was very surprised by the number of solutions that would only allow one level of subtasks. Creation of folders, projects, and tasks is extremely easy. It's also very easy to attach files, comments, and additional details. Much easier and faster than Teamwork. Inviting new team members and assigning them (or existing members) to folders, projects, or tasks is extremely easy and quick. Doesn't require a ton of additional clicks. The recurring task system is very broken. It currently just duplicates your task(s) x number of times instead of renewing them after a requirement is met (i.e. date range or status). This might seem trivial, which is how I expected it would be, but it's not. It can quickly clutter your timeline and make it very difficult to sort through your tasks. If you need to move subtasks between main tasks, the current solution is a bit of a runaround. Obviously, setting up tasks/subtasks right the first time will make things a lot easier for you, but just know that if you need to make changes and move subtasks later on, it's going to take some time to get them moved. The name is problematic. Anytime we tell people about Wrike (clients, employees, partners, etc. ), they immediately question the name. This might seem like a dumb complaint, but it derails many important conversations. Since Wrike sounds exactly like Reich, people get uncomfortable when it's mentioned. This is something you'll just have to deal with if you purchase the software because I don't imagine they'll be changing the name anytime soon. Wrike is great for communication/coordination within teams and between teams. It allowed us to create a streamlined process of onboarding, processing, serving, reporting, invoicing, and offboarding for each client. This process requires the efforts of multiple individuals from multiple teams, as well as the sign-off and approval from team leaders. It's also great for and services company or freelancer that needs to show accountability for their work, as we client can be added as a "collaborator" on any given project or task. User Review: "Wrike is right for us." Everyone in my org uses Wrike for all of our business processes - from a simple to-do list for items we want purchased or picked up at the store, all the way to using it for Agile development tracking using the "Board" view for project issues. I tried out multiple applications for this kind of functionality, but none were able to combine all the functions I wanted in a simple, clean, elegant interface. Wrike is critical to my company. Without it, I'd be using 3 or 4 different solutions to do what I do with it. Project Scrum Boards. I have one user who loves lists. I prefer the board view. When we get a project manager pulled into a project they prefer using the Timeline or Stream views. All so easy to switch between. Conversion of notes and data collection into a project. We have so much research going on and dump tons of information into folders. When we're ready to pounce it's so easy to turn it into a full-blown project. The communication is so easy in Wrike. I know a lot of people love Slack, but Wrike does all of that plus more. An updated app that gives me the full Wrike experience on my phone. The app is great for communications and note taking, but not for managing the projects. Quick projects. Targeted projects. Fast spin up and burn down. These are where it excels. If you want a massive multi-year project with lots of resources and project managers all working together, perhaps a larger scale application would work better. But for startups, small businesses, Wrike is the application I will go to every time. 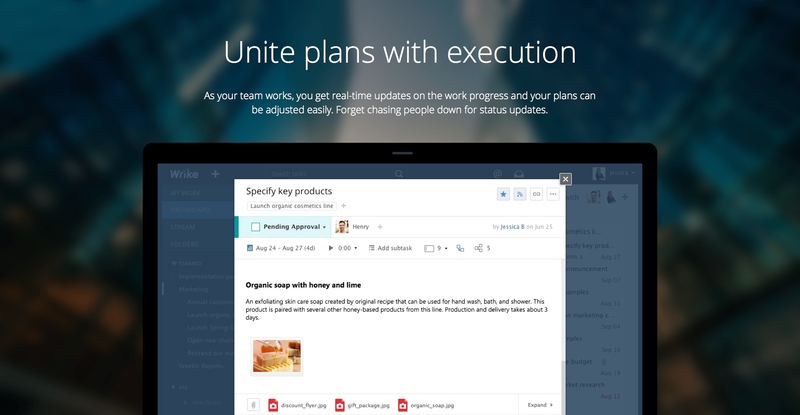 Wrike is an all-in-one project management and collaboration software. This solution connects tasks, discussions, and emails to the user’s project plan. The vendor’s value proposition is that their solution enables users to get an up-to-date picture of projects and keep their team aligned with their strategy and eliminates the need to have status meetings. According to the vendor, Wrike helps solve: data silos, poor visibility into work status, and missed deadlines and project failures. Additionally the vendor says some of the main benefits of using their solution include: accelerating project delivery, keeping all team members on the same page and real-time collaboration. According to the vendor, their solution provides usability, customization and scalability.